With freezing temperatures just around the corner, now is the time to get your home ready for winter. Putting off these projects could lead to some serious and expensive problems once winter is in full swing. So get started now to protect your home from colder weather using the tips below. Keeping the warm air in and the cold air out is one of the most important things you can do to get your home ready for winter. Most air leakage will occur around the edges of doors and windows, but inadequate insulation of your attic and external walls can also be an issue. An easy DIY fix is to simply replace the worn out weatherstripping around your front and back doors and around your windows. 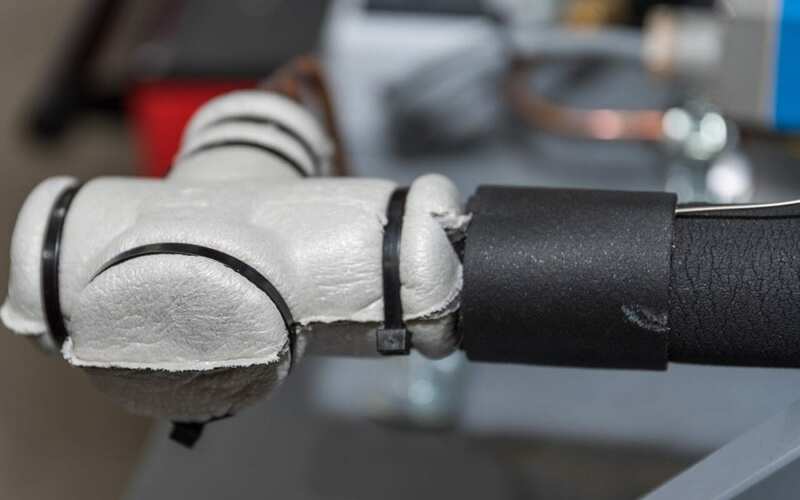 The rubber or foam stripping only costs a few bucks to replace and it can be done in a matter of minutes. Just measure the length that you need, cut it to size, peel off the backing to expose the sticky side and then put it in place. And don’t forget to check the weatherstripping along the edge of your garage door, too. Prepping your pipes for sub-freezing temperatures is essential to preventing burst pipes and water damage. For outdoor plumbing, start by disconnecting, draining, and storing your garden hose for the winter. Then disconnect the sprinkler piping to allow water to drain away more easily. If you have it in your budget, you should also hire a professional to blow the water out of your sprinkler system. Crawl spaces under your home should be sealed to keep the freezing air out and allow the warm air flowing down through your floors to accumulate. Pipes under the home can also be wrapped with insulation to help them maintain warmer temperatures. Pipes inside your walls are warmed up by your central heating system. Even if you are leaving on vacation, you should leave your heat on to keep those pipes from freezing. Setting the thermostat no lower than the mid-50s should be sufficient. Open the cabinets under sinks to give pipes contact with warmer air and on very cold nights, allow them to slowly drip. The easiest way to get your home ready for winter, even for families who live in warmer areas and aren’t worried about sub-freezing temperatures, is to simply get your central heating system, fireplace, and chimney inspected before using them. The inspection may reveal that you need to have your ducts cleaned, your chimney swept, or that other repairs or maintenance are needed. Ice dams form when the snow on the warmer parts of the roof melts, trickles down toward the edge of the roof, and then refreezes, forming a dam that holds back even more melted snow. Eventually, these drifts become so heavy that they can damage parts of the roof and gutters. To prevent ice dams, close attic bypasses and keep warm interior air from leaking up into the roof. Trap the warm air inside your home and attic and insulate your roof as much as possible to keep the roof exterior cold. This can be a complicated job, best done with help from professionals. There are a lot of things you can do to get your home ready for winter, but this short list covers some of the basics that every homeowner should know. Some of these quick little projects can be completed in an afternoon, but others will require some planning ahead. So don’t put it off. Get started winterizing your home today. First Choice Home Inspectors provides inspection services throughout Middle Tennessee. Contact us today to schedule your inspection!